After realizing that I needed to come up with better financial reports to share with my wife; I decided to focus on monthly cash flow for now. I showed this to my wife and we walked through our income and expenses for the month. Its a limited picture of our income and expenses. It ignores income taxes, payroll deductions, stocks, investment real estate, side income, expenses and reimbursement of assignment housing from my employer, etc. Rather it focuses on those things that my wife plays a significant role in - housing, food, and other household expenses. A great outcome of the discussion was we discussed and came up with our 2008 financial goals. Assuming we get into a rhythm with reviewing this report, we will try likely build on this over time with any other areas my wife or I want to talk about. I think its a good start. 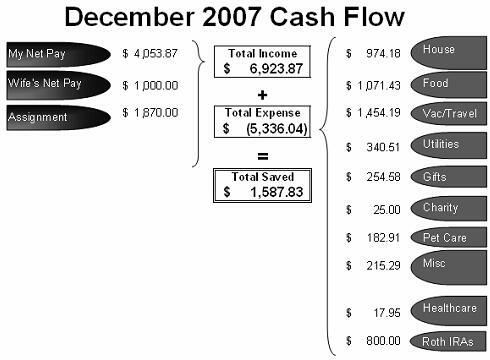 I like that method of displaying the cash flow. I think I'll adopt something similar with my own monthly budget. 1) it presents net pay but does not present info about net accumulation of 401K & ESPP assets. These are significant. 2) What is the other income? I thought your wife was not working for pay in China. You say in the notes that you ignore employers reimbursement for assignment; so what is the $1870/mo? 3) You might want to organize the expenses by fixed non-discretionary expenses (e.g. rent, basic food, utilities, healthcare) and variable discretionary ones. 4) Providing net pay works fine as long as withholding approximates actual taxes. If you underwithhold, you overstate net income and if you overwithhold, you understate net income. 1) It ignores alot of things including 401k, ESPP, rental income, income from business. I figured I would try and keep it simple and grow into these things over time if it made sense. I am thinking that the meat of what we need to talk about for now is the stuff presented in this chart -- how much we have coming in and going out and the tradeoff discussions we need to have. 2)The $1870 is assignment reimbursement of everything except the housing reimbursement. I know it makes this a bit confusing. I also pay for an apartment in China and get reimbursed by employer, but ignored it in this chart to try and keep it simple for our discussions. 3) I like this idea - may try it on next months. 4) Yes and this could be an issue since we are likely underpaying our taxes since this is the 1st yr we are married. However, in my eyes this stuff doesn't have to line up with everything else. Just because this cash flow report shows we saved $1,500 doesn't mean we really saved $1,500 --thats ok because its not the point of the report. The point is to have a tool to help my wife and I communicate about our income & expenses and help us visualize and discuss the tradeoffs we need to make together. If we have to make a $1000 tax payment in April and it doesn't show up on the chart its ok for now -- we will adjust our withholding and things should improve over time. $1000 for food in one month? for the two of you? holy smokes. going out for lobster dinner several times a week? It appears that without that "assignment pay" you are in the red...have you thought about how you are going to keep in the black post assignment? This is a bit alarming, no? Without that "assignment pay"...you are in the red. What are you going to do when your wife is not working and you don't have the assignment pay? 2) We still eat a mostly western diet and we are paying for it. It is certainly helping my wife and I cope with being so far away. 4) My wife and I have established a 1500RMB (~$210USD) weekly food budget that seems to be working quite well. As for being in the red - yes and no. We took a $1500USD vacation in December that is out of the norm for us. After our assignment is over we won't be taking any expensive travel for the foreseeable future. We are just trying to maximize our oppurtunities while we are here -- I expect us to go on 2-3 more trips in the next 6mo at an avg expense of ~$1500-$2000USD. I am an expat in an expensive Asian city, and I commend you and your wife for your frugal lifestyle. $1,000 per month for food (groceries and eating out) is not at all extravagant. And getting through December spending only $250 on gifts is amazing. Other than travel, I don't see much spending beyond the basics here. No clothes shopping sprees or tacky souvenir purchases. Great that you are living without a car, (though I don't see any expenses for local transportation). Living abroad, away from seductive US advertizing and keeping up with the Joneses, is great for your financial life. You realize you need very few "things" to be happy. Enjoy your time in China! It seems to me that the money that you contribute to a ROTH IRA is not really an expense but rather savings. Financial Expat - thanks for the comments. Transportation costs were in the vac expenses this month because that was the only transportation expenses we had -- may seperate them out going forward. Dividendgrowth -- You are absolutely correct, I am mushing things together here, but saving for retirement is an "expense" to me - that is its not optional, this is money that comes out of our cash flow every month and we can't assume that is extra money we are saving. By portraying it this way I think it helps accurately portray the amount we are saving (above and beyond retirement). However let me know know if anyone has better ideas to improve this. As for pet care vs healthcare - our annual healthcare expenses are way high -- however they were all front loaded before we left for china. The $182 was all a vet bill for annual vaccinations - ouch! In the future could you post a full monthly cashflow report? I see your monthly net worth reports that have your net worth increasing by over $10,000, but according to this post you only saved about $1,500. I want to see where the extra income is coming from.